Lingotek - How Do You Know When You Need A TMS? Home / How Do You Know When You Need A TMS? At some point in time, every global organization must ask themselves the question: Is it time for us to invest in a Translation Management System? The answer to this question depends largely on what your multilingual content needs are. To help determine if you’d benefit from a TMS, let’s take a look at some of the key features that a TMS provides. If you’ve ever been involved with getting content ready for translation, you know how hard it can be. A TMS can handle the file prep for you by seamlessly pulling in your content and prepping it for translation by removing all of the non-translatable elements and breaking the text into bite-size segments to aid the translation process. Once the translation process is complete, the TMS will export the translated content back to its originating file type, with all of the images, style, and formatting still intact. A good TMS will support a large variety of file types, including MS Office files, HTML and XML. File preparation is only part of the equation, however. The other part is knowing what needs to be translated, and when to translate it. The best TMS products on the market will provide a robust API for automating file selection, upload, and download. A select few TMS vendors even provide already-developed integrations between your content repository of choice and the TMS software. 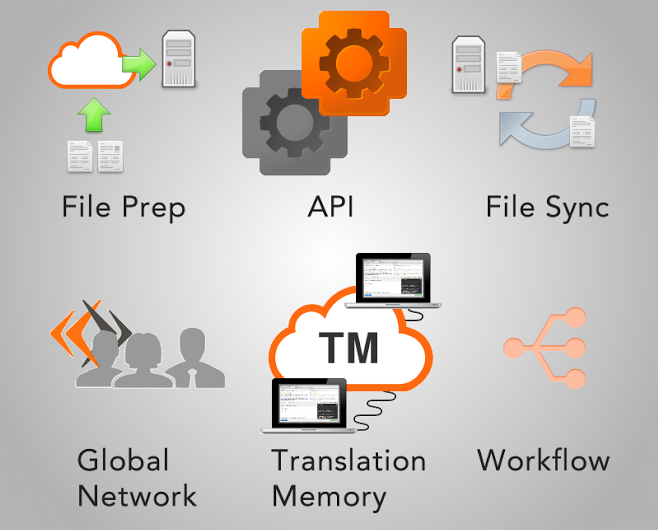 By leveraging the API for a TMS, you can eliminate the overhead of gathering files, sending them off for translation, and then saving the translated files back out to wherever it is they’re supposed to live. If your multilingual content changes a lot (think: your company’s website), then you know that keeping up with the rate of change can be a mind-numbing task. One way that a TMS can help with this is by synchronizing changes between your Content Management System and your Translation Management System. As the changes get synched between the two systems, your TMS will be able to recognize where changes were made that require new translation. More importantly, the TMS can ensure that your previous translations are retained for those sections of your content which did NOT get changed. There are a handful of cloud-based TMS vendors that provide the ability to outsource translation to a marketplace of freelance translators. This can be a great way to reduce costs for professional translation, without having to build your own internal translation department. If you prefer to also outsource the management of your translation projects, owning your own TMS empowers you to hire a language service provider (LSP) without losing visibility into what’s happening throughout the translation process. One of the most frequently-cited reasons for purchasing a TMS is translation memory. As content gets translated, a TMS stores those translations as translation memory (TM), which can be used to aid in the translation of your other content. The more content you translate, the smarter your TM gets, saving you more and more effort (and money) as time goes on. If a one-size-fits-all approach is no longer working for the translation of your content, a TMS that supports workflow customization may be what you need. A good TMS enables you to customize the translation process to fit your needs, according to your timeline, budget, and the type of content being translated. You may choose to use machine translation for one project, professional translation for another, and crowdsourcing for yet another. The more workflow options that your TMS provides, the more efficiently you’ll be able to use your translation budget.